A new bridge with a "vital role" in the Borders Railway project has been lifted into place in Galashiels. A 15-strong team worked throughout Saturday and Sunday to install the 90-tonne structure above Wheatlands Road. Network Rail project director Hugh Wark said the lift had gone "very well" and thanked businesses and residents for their "patience and co-operation". 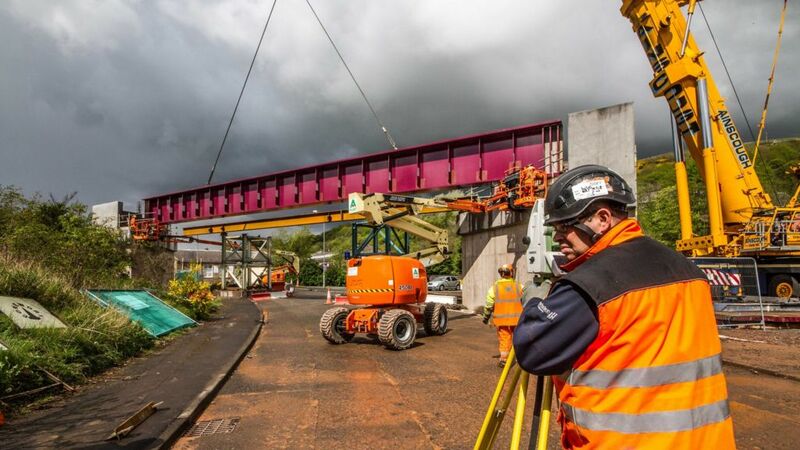 A new bridge with a "vital role" in the Borders to Edinburgh railway project is lifted into place at Galashiels. The new rail bridge over Wheatlands Road, Galashiels, taking shape on 3 May 2014. View is south, with the road bridge carrying Plumtreehall Brae visible in the left background on the other side of the Gala Water. View north across the Gala Water to Kilnknowe Junction on 3 March 2014, showing the bridge works at Wheatlands Road.